Gandhi’s movement for non-violent social change challenged America. Can Martin Luther King, Jr. do the same for China? Bringing King to China is the story of a young American teacher in Beijing, whose failed protests against the Iraq war inspire her to produce a play in Chinese (Passages of Martin Luther King) about Martin Luther King, Jr. Her journey begins after she learns (mistakenly) that her father, an ABC journalist covering the war, has been killed by a suicide bomber. Bringing King to China documents a cross-cultural dialogue about the current relevance of Dr. King's philosophy of peace and non-violence. The feature-length documentary conveys the lead character's "dream to build a bridge between the societies by talking about peaceful struggle and universal rights" (The New York Times). It chronicles her twelve-month struggle to interpret and adapt King's message for Chinese society, preserve the historical accuracy of the U.S. civil rights movement, clear bureaucratic hurdles before opening night and raise funds to pay the theater company. Powerful and intimate, the film takes American viewers backstage at the National Theatre of China, as Chinese actors rehearse with African-American gospel singers. Bringing King to China marks the first time in the modern history of Chinese theater that Chinese and African-American actors have shared the same stage. 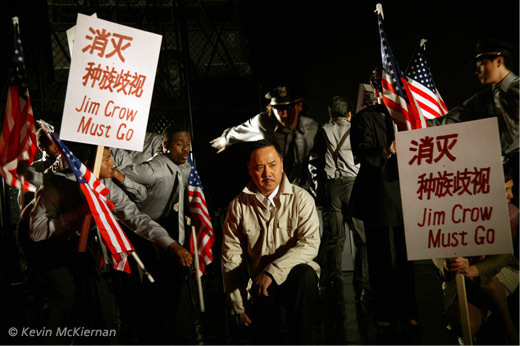 Titled Passages of Martin Luther King, the play was a joint production of the National Theatre of China and the Martin Luther King, Jr. Research and Education Institute. 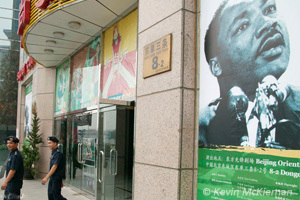 Bringing King to China is a vehicle for American audiences to examine Dr. King's international impact and to access the changing beliefs of China's future leaders. The film provides a unique lens for Americans to review the history of the U.S. civil rights movement and to wrestle with Martin Luther King Jr.'s inspiring call for global peace, one of his important—but lesser known—beliefs. Bringing King to China could not be more timely. More than forty years after his assassination, Dr. King's legacy as an advocate for economic justice and international peace is increasing. 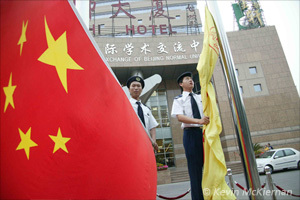 Today, Dr. King's name is invoked in struggles for self-determination in China, Egypt and many other parts of the world. In the U.S. the new King memorial on the National Mall, designed by a Chinese sculptor, has opened in Washington, D.C.. Last year, the same play that was staged in Beijing, Passages of Martin Luther King, by King scholar Dr. Clayborne Carson, was translated into Arabic. It premiered in Jerusalem.